It’s been over a month since I poured my heart out and let you all know where I’ve been in my life and what’s been going on. My life was completely in the hole… a deep, dark hole that I struggled to climb out of and when I did manage to get closer to the top, where I could see the light, I’d slip down again. I’m not in that hole any longer, but that is due in part to taking anti-depressant and anxiety meds. Meds are not the answer though. I fully feel that they’re only part of the healing process and becoming whole again. The best way that I can explain it what a close friend said to me. You have to take care of yourself mind, body, and soul and when you focus on one area too much you tend to let the other areas slip. Through the medication, therapy, taking care of my physical health, and working on my relationship with God I will be where I want and need to be eventually. As the new year began the usual things flew around social media like setting goals, resolutions, and a word for the year. I thought about this and tried to think what would my word for the year be (no resolutions here… I never keep them). At first I couldn’t think of anything … no words came to mind and then after some time many words came to mind and I couldn’t figure out how to narrow it down to just one. So instead of a word for the year or a resolution I have a phrase… a sentence if you will. 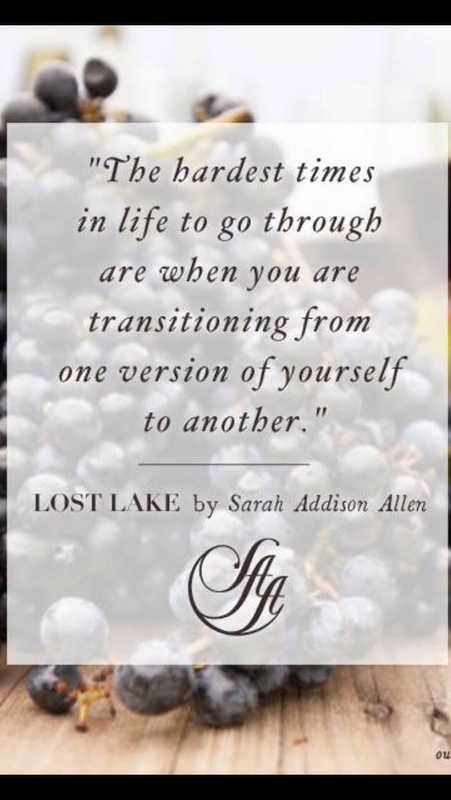 This is from one of my favorite authors, Sarah Addison Allen. She posted this on her Facebook page promoting her new book that is coming out this month and when I saw the quote it spoke to me… so I saved it and it’s my current image on my phones lock screen. Every word of it is true. I am trying to leave the past behind, work on forgiveness, dealing with my depression and anxiety, and becoming a better person all around. In essence, I’m transitioning to another version of myself and yes, it is hard. Damn hard. Recently, Jennie from A Lady in France (by the read her book… it’s awesome!) and I have emailed back and forth a few times. I’ve spoken to her briefly about where I am and the journey that I am on and she shared with me a piece of scripture that someone shared with her when she was first on her path to being a Christian. Now, I am sharing it with you. This is special to me and I keep a tab open to this scripture and read it at least once a week. It’s a reminder that I am not alone and that there are good people out there. More importantly good friends who really do care about me and how I am doing. Did you come up with resolutions or a word for the year?